Sometimes the small things in life start adding up. Other times we face large issues. For many of us we’re stuck going to an office or workplace we don’t want to go to. Some of us live in places we’d rather not live. At some point we all confront large challenges we’d rather not think about, let alone face. Plus, we encounter events in life that we’d prefer would never happen. In short, the ways life doesn’t happen how we want it to are incalculable. So, does that mean we’re doomed to unhappiness and discontent? As touched on in Uncovering a bit of truth about happiness, the answer to that is “no”. Even with life not offering us everything we want — while also giving us many things we’d rather not have — happiness is available to each of us. There are many ways we can uncover our happiness, and each of us will find approaches that are more, or less, appropriate for our situation. Ultimately though, a big part of uncovering our happiness comes from realizing that we have more control over our happiness levels than we think, and that there are actions we can take to be happier. That aspect of taking action is important, and doing so puts you in the driver’s seat. When it comes down to it, you’re in control of how you interact with the circumstances that exist in life. You’re in control of whether you did your best or not. Meaning, you’re in control of how much you enjoy your journey. So, how can you be sure to do your best when there’s so much going on in life? In a way, it can be as simple as asking a single question. The simplicity of this question hides a deeper nature. To begin with, the question itself puts you in a place of power. You decide what your best is, and if you’re meeting your own definition. It reminds you that even with so much of what happens in life being out of our hands, the way you interact with, treat, and be in each moment is within your control. By asking this question you remind yourself of the bigger purpose and aim; to make the most out of what we have, in the moment we have it. Additionally, asking this question provides a prompt to be more mindful — which in and of itself is a powerful tool for uncovering greater happiness. Asking “Am I doing my best to enjoy this journey?” is a great way to begin interacting more consciously with each moment. When you’re in the heat of the moment though, it can be easy to forget about asking it, particularly if you haven’t trained yourself to do so. By making a simple tweak to the wording, you can extend the question to help you apply it consistently, and ultimately train your brain to begin asking it in the moment. The simple tweak is to rephrase it as “Did I do my best to enjoy my journey?”. 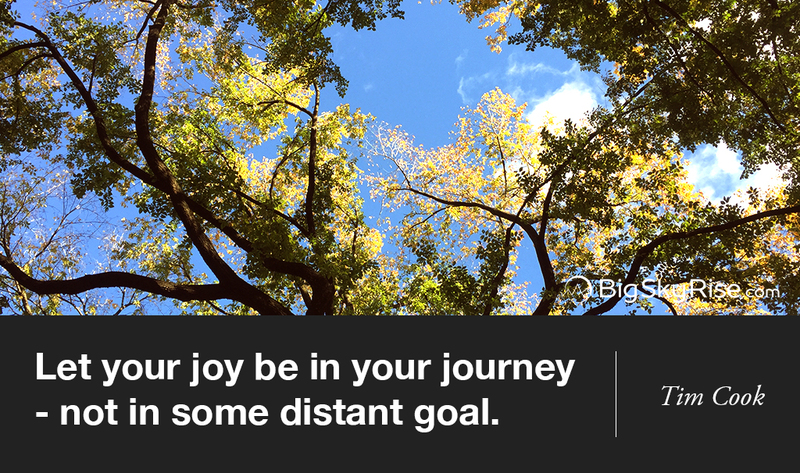 Asking the question as “Did I do my best to enjoy my journey?” transforms it into a tool for reflection. This allows you to look at the actions you’ve taken, and interactions you’ve had, and then determine if you feel you’ve done your best so far. By assessing whether you did your best or not, you can observe the actions you took and the way you interacted with the moments you had. Through that you can observe how greater mindfulness in daily moments will help you respond to situations in more skillful ways, thus allowing you to enjoy your journey and life more. Additionally, this simple and minor alteration gives you another big benefit since you can now easily set a daily reminder to answer the question each night before going to bed. By creating a regular prompt of this sort, you act with consistency. Among many things, that consistency signals your brain that doing your best to enjoy the journey is something you deeply care about. When you ask yourself “Did I do my best to enjoy my journey?”, it naturally prompts your brain to also ask, “What can I do in order to do my best tomorrow?”. That leads to the realization that in order to do our best to enjoy the journey, we must be more mindful to do our best in each moment, as it happens. That realization, and the signal sent by your consistency, begins the internal process of training your brain to ask the question “Am I doing my best to enjoy this journey?” more frequently in moments as they happen. Prepare yourself, when asking this question, it can be easy to find an answer you’re not thrilled about. Regardless of our intentions, sometimes we fail to do our best as we’ve defined it. The key is to remember progress instead of perfection, and that we all stumble along our journey. When that happens, there’s no need to carry guilt or anger with yourself. Guilt and anger only interferes with your ability to do your best to enjoy the journey starting now — and that is really the point of the question. We can only do our best in this present moment, we can’t change the past, and the future is outside our reach. The present moment is the only one we have. So, recenter on the present and do your best to enjoy your now. You have control of how much you enjoy your journey. You’re in control with how you interact with the circumstances that exist in life. By practicing consistently, you can train to be more mindful in the present moment. The simplicity of this question can be a bit deceptive. As a result, it can be easy to cast it aside thinking it won’t actually be helpful. It’s simplicity though is partly what makes it so powerful. So, as you begin asking yourself this question, be sure to approach it openly and honestly. Your approach and honest effort is a big part of making this question work. Please consider sharing this post with the people in your world who might find it helpful.